The newly updated Google+ Badge for profiles are probably the most exciting update. They are much more customizable, including portrait and landscape modes, light and dark themes, and turning on/off items like the cover photo and tagline. While they don’t allow you to specify the color you want, I’m sure the ability to have a dark themed background will be a welcome addition for a lot of people. 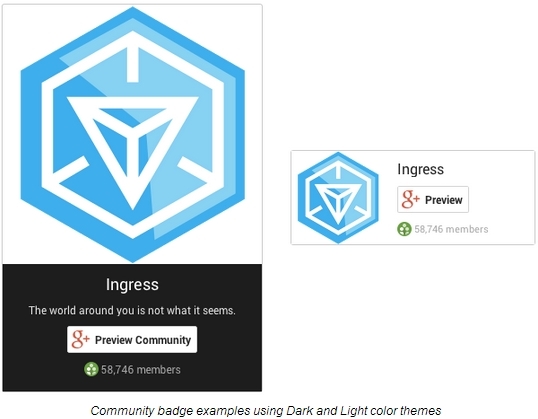 Community managers have been asking for a way to attract members across the web, so today we’re introducing badges for Google+ Communities. These badges are highly configurable, making it easy to match your site design. Existing badges will stick around for up to 90 days, giving you time to configure the new version for your website. 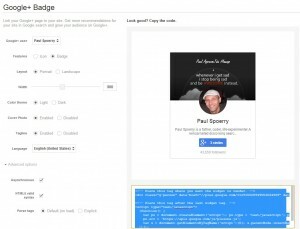 After 90 days, Google will automatically upgrade any Google+ badges to the new design. Finally, today’s plugin updates include a new visual style that’s more consistent with the recent improvements to Google+. This includes the +1 and Share buttons, which will be updated automatically over the next few weeks.